Saint Patrick’s Day is one of those holidays that I just can’t get into. Mostly because I look awful in green. Also because I don’t like beer which ruins the whole “OMGGREENBEER” thing for me. Last year, however, I found a reason to celebrate: Irish Soda Bread. I fell in love with it. Pretty sure I ate the whole loaf by myself. I wanted to make it again this year but in an effort to shake things up, I turned it into scones. Scones are awesome because they’re buttery and flaky and sweet but not overly so. They turned out perfect – I split mine in half and covered both sides with salted butter; so good! Preheat oven to 425F. Line a large baking sheet with parchment paper. In a mixing bowl, whisk together the flour, baking powder, baking soda, salt, and ¼ cup sugar, making sure to remove any lumps. Using a pastry cutter, 2 knives, or your fingers, work the butter into the flour mixture until you have coarse crumbs. In a small bowl, whisk together buttermilk and egg. Pour into the flour mixture and stir until just combined. Fold in the raisins, being careful not to overwork your dough. Bake for 15 - 20 minutes, depending on the size of your scones. The scones should be a beautiful golden brown. Transfer to a wire rack to cool slightly before serving. 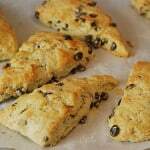 11 Responses to "Irish Soda Bread Scones"
Yum! Great creative recipe – much more exciting than ordinary soda bread! Ooh I like this idea. I still haven’t tried soda bread yet. This sounds awesome. Great idea! I’ve never been a huge St. Pat’s day fan. I love your creativity with Irish soda bread. I love scones! 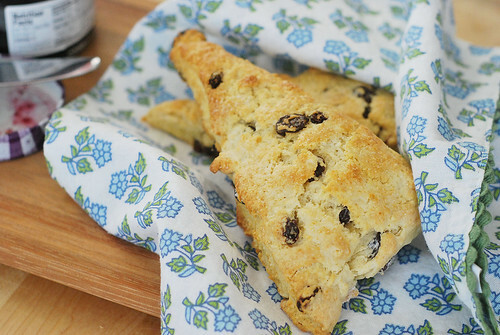 Love that you turned it into scones -great way to enjoy it all day. I am so with you, I just can’t get excited about St Patty’s Day. I usually try to post a recipe or two on my site for others anyway, but I’ve been slacking this year. My stepdad would absolutely love these scones, I am going to deliver him a batch this week for sure! 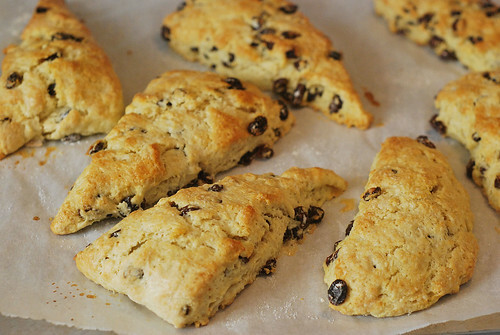 What a great version of scones! I have never tried Irish Soda bread before. I made a muffin version the other day but after your post, I can’t wait to try the scone version! I’m with you on the beer drinking thing. And unless the green coloring magically adds delicious flavor, I’m not drinking that, either. I would much rather eat scones! I have a hard time making good scones, but these seem to have enough fat and moisture, so I think these are definitely worth a try!